The half-bridge type II configuration only measures bending strain. 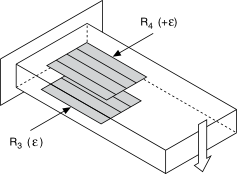 The following figure shows how to position strain gage resistors in a bending configuration for the half-bridge type II. The following equation converts voltage ratios to strain units for half-bridge type II configurations.